Bharti Airtel Ltd has decided to wean away subscribers who barely add anything to its kitty, according to a Mint report. The company said on a call with analysts that about 30% of its 333 million India wireless subscriber base generates low double-digit Arpu (average revenue per user). To correct this, it has introduced plans that ensure a minimum Arpu of ₹ 35 per month. A year ago, Airtel’s average monthly voice usage was around 500 minutes per subscriber. Assuming the extreme case of subscribers who only received incoming calls and that half of this was from other networks, that meant an Arpu of ₹ 35 just through IUC collections. The IUC cut means these subscribers now generate about ₹ 15 per month for the same volume of incoming calls; from 1 January 2020, when IUC will be abolished, this will turn to zero. It’s evident why telcos now want these subscribers to pay to keep their connections alive. 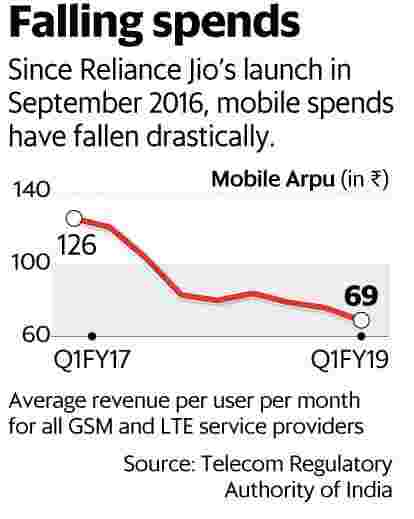 For telcos, raising tariffs in this segment looks like a solution that may work, especially since Reliance Jio Infocomm Ltd seems disinterested in this set of subscribers. Its minimum recharge plan in the feature phone category costs ₹ 49.